Pearsl are favorite jewelry and symbol of the East. They are considered the personification of purity and innocence, as well as a pledge of matrimonial fidelity and love. Indian sorcerers claim that the pearl contains three main elements: Air, Earth and Water. In their opinion, this explains its calming effect. In addition, it has the property of increasing vitality, health and strength. Pearls are mined in warm seas off the coasts of Japan, Australia, Latin America and India. Pearls have many shades: white, yellow, blue, red, pink, black. There are pearls of river and sea origin, natural and artificial. The largest island, where it is mined from ancient times, is Margarita in the Caribbean Sea. That is why it is often called the "Pearl of the Caribbean Sea". In addition, the island is famous for its picturesque landscape, mountains, beaches, mild dry climate. In order not to be mistaken with the choice of pearls and not to acquire a fake, one should be able to distinguish natural stone from artificial. Before you buy the product, you should compare the quality of the proposed jewelry. Choosing pearl jewelry, you need to pay attention to the difference in color shades, sizes, purity and roundness of the stones. However, the most careful attention deserves the color of the stone. This is the key indicator. If you are choosing a colorful ornament, it is strongly advised to consult the seller whether the color is genuine or not. As a rule, natural colored stones are more expensive than ordinary whites. 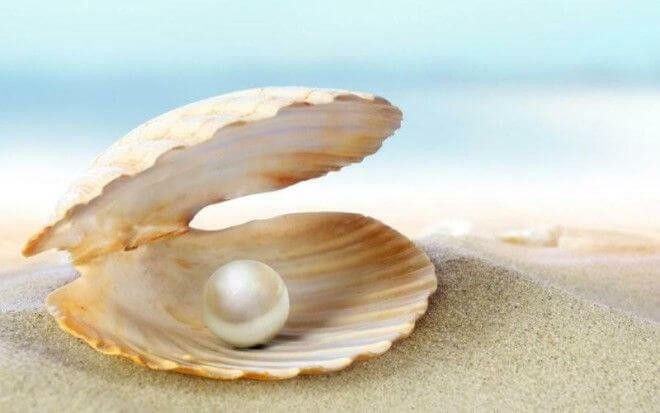 To check the authenticity of pearls, simply put a pearl against the surface of a tooth - a real stone should creak. Great Coco Chanel made pearls the most democratic decoration, suitable for any woman. She considered it to be the most important element of most of her collections and approved the classic combination of a white string of pearls with a small black dress, an elegant dark jacket or a sweater. Such a necklace will transform even the simplest outfit. It is appropriate to wear it in a set with an evening, cocktail and even a wedding dress. It's a classic that will never go out of fashion. Long necklaces in the Chanel style, as well as colorful strings of pearls of non-standard form, have become very popular lately. They look much fresher and more rewarding than ordinary white necklaces. Modern designers are often inspired by the images of the 50s and 60s. Pearl jewelry in any design is a stylish detail, which can be easily picked up for an individual style. Due to the fact that pearls can shine in a variety of hues, it looks incredibly spectacular and interesting. The tones of pale green, pink, golden, blue and even black color of the stones act as an effective alternative to the classic white pearl necklace. Some colored pearls are a rarity, and therefore are several times more expensive. Such rarities include golden, pink and black-green pearls from Margarita Island in Venezuela. The main advantage over other jewelry is the temperance of pearls. Despite the fact that these stones are not as bright as diamonds, they still allow their owner to glitter. Recently, pearls have become very popular, they are used in various ornaments: earrings, rings, necklaces, bracelets, brooches. Natural pearls are a profitable investment of cash. In comparison with other precious stones, their undoubted advantage is that they have affordable value (which depends on the origin). So a natural necklace from river stone can be purchased at a price of about 100 US dollars. A discreetly sparkling pearl necklace at once makes its possessor noticeable. An excellent specimen will be flawlessly round and quite expensive, because an ideally round pearl is a huge rarity. Natural pearls mined on the island of Margarita, can range from 1000 to 10,000 dollars apiece. Natural sea pearls, grown by man, ripen within the mollusk for about two years. The process of cultivation of stone is completely controlled by man. The advantage of this method of obtaining a stone is that you can control the shape, size and color of pearls. Despite the fact that the process is not particularly labor-intensive, the cost of one such stone can range from $ 100 to $ 600. The most valuable is the cultured pearl of black color. Its price may reach up to 1000 dollars for one pearl.